The thing about additive manufacturing is that there are still subtractive elements to most methods. This is especially true of FDM 3D printers, which is what almost all personal printers are. After an object is printed, any extra bits of material must be manually removed to have a finished product. Some extra material is necessary for support and some is the result of layers that are printed to separate the object from the build platform, but whatever it’s for, it’s got to come off. If iRobot’s recent patent gets executed on accordingly, you may not be picking plastic bits off of your prints for too much longer. 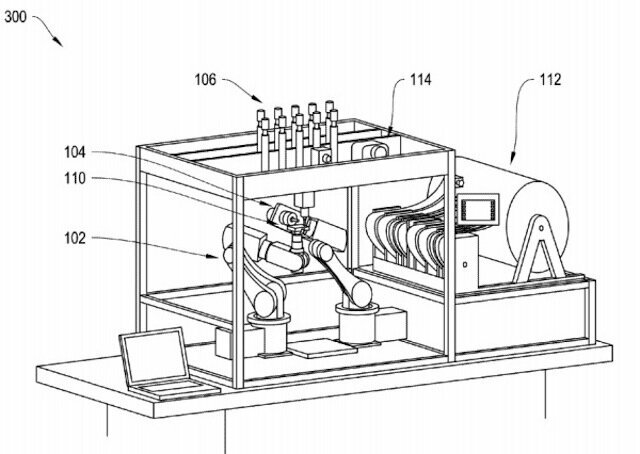 iRobot’s automated, robotic finishing system in a patent illustration. Yes, the company that makes the robotic vacuum called the Roomba has plans to create an automated, robotic finishing system that will intercept objects from 3D printers and get them to end-product status before reaching your increasingly busy hands. The “Robotic Fabricator” will have two arms, both fit with grips and loads of sensors for gentle dexterity; six degrees of freedom will allow objects to be completely turned and rotated as necessary to get smooth results. Having one of these attached to a printer will essentially be like having an assembly line, especially considering what robotic arms can be programmed to do. A drill will be fixed for milling and the arms could also glue objects together, so that’s a lot of time you could spend designing more things to print. iRobot is all about “Making Robots work for you,” and this latest idea fits perfectly with that goal. 3D printers make making easier and this robotic system will make the whole process exponentially more efficient. The digital file that a 3D printer uses to produce a physical object could be used by a Robotic Fabricator to know how to mill and polish that object, so when you press print, the object will be presented to you as ready to use. Near-net shape manufacturing will soon be an outdated mode of production.